‌Big data, satellite images, the Internet of Things—the data revolution is transforming lives all over the world. And yet, policymakers in developing countries still lack most of the basic data about people and their environment. 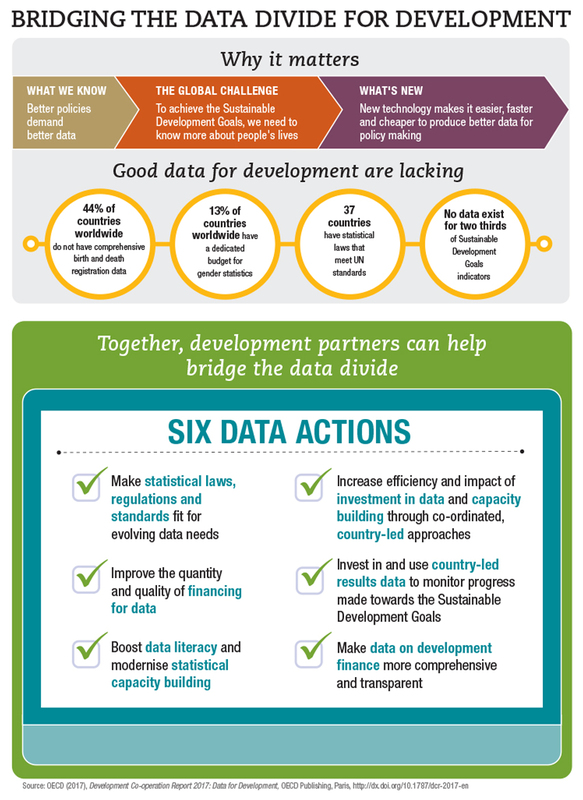 How can development cooperation partners help bridge this data divide? The new OECD Development Cooperation Report focuses on how better data can help boost inclusive growth and fight inequalities. Join us on November 29, 2017 at the OECD Washington Center for a presentation of the new report and recommended actions for Bridging the Data Divide for Development. The presentation will be followed by a live panel discussion on the next steps for the international community. A light breakfast will be served at 8:30am. The presentation will begin at 9:00 am. This year's report focuses on the enormous potential for harnessing data and technology to enable development that leaves no one behind. With the unfolding data revolution, developing countries and donors have a unique chance to act now to boost data production and use for the benefit of citizens. The report also identifies challenges that could hold back progress toward long-lasting development, such as gaps in data collection and usage in developing countries. In addition, building statistical capacity to produce and use data is not a priority for the donor community: in 2015, international support to statistics represented only 0.30% of official development assistance ($541 million). This report sets out actions and good practices that will help policymakers and development assistance providers to bridge the data divide for development.